Defiled Crypt Trap Triggers; Map provided courtesy of Zombiejesus. B triggers Cloud of Blades; I Triggers Ice; G triggers Guards. 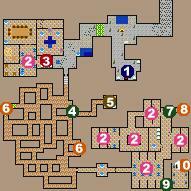 Upon first entering the crypt go talk to Bohen-Ihrno to receive your quest and then go to the west to begin exploring. The small hut in the northwest corner contains a couple items of note, particularly a small platinum key which I forgot t mark on the map. Explore all the rooms, killing the Vahnavoi in the hallway. There's a Blademaster Charm in one of the crystal boxes in the room to the east of the Vahnavoi and a platinum key in a dresser in a room to the west. Now head down the stairs just outside the hut into the main part of the crypt. There's going to be clouds of blades and ice while you're exploring down here, so try to move as quickly as possible. There are also a couple passages that if you enter them you'll be attacked by a variety of Vahnatai Undead, so I usually try to hug the outer section of the walls as much as possible to avoid them. At the bottom of the stairs, just to the east is a secret passage which will take you to a tome teaching Radiant Shield Lv.3. You'll need Move Mountains Lv.2 or a Stoneshatter Crystal to reach it. There are two sets of runes, one in the northwest corner of this wall, and one about halfway down the eastern wall. Step on the southern rune in the northwest corner, and the northern rune near the eastern wall. This will clear a couple statues allowing you to enter the main part of the crypt in the southeast corner. There are quite a few undead in this area, pretty much in every room, in fact, so be prepared to fight them. The only ones to really take note of are in the small locked room that stands in the middle of a slightly larger room in the northwest corner of this section of the map. One of them will drop a Gymnastics Mind Crystal. Once you've cleared this area go to the northeast corner of the section and look for a secret passage with a rune at the end. Step on the rune and then head down to the southeast corner of the section. A section of wall will have slid back allowing you access to the Crystal Souls. These are what Bohen-Ihrno wanted you to find, but before going to tell him, check the Crystal Soul in the northeast corner of the room, as it will give you a level in Vahnatai Lore. The Crystal Soul in the northwest corner will drain you, so don't use it if you accidentally get to close.